Permitless concealed carry passed the North Carolina House of Representatives over a year ago. Since then it has been bottled up in the State Senate and has not gotten a hearing nor a vote. Now that the Republicans have lost their supermajority in the General Assembly, any action on permitless concealed carry has to happen now. There is not a chance in hell that Gov. Roy Cooper (D-NC) won't veto it and there is also no way for it to get passed without the Republicans sticking together and overriding that veto. There is a season for everything. A time to pass HB-746, while a Governor’s veto can still be overridden, is upon us. . . In recent months, North Carolina’s Republican senate leadership disappointed us with their inaction. Senate President Pro Tempore Phil Berger’s ostensibly pro-Second Amendment party had the numbers necessary to override a governor’s veto. To pass HB-746 (Permitless Concealed Carry and more), the NC Senate certainly had the support of the people. In fact, North Carolina gun owners, and other pro-civil rights citizens, were not only supportive of the bill, they downright demanded it. Yet, Senator Berger and Senate Rules Committee Chair, Senator Bill Rabon, didn’t deliver. They decided not to shepherd this excellent pro-gun bill through the NC Senate (it has already passed the NC House). Fortunately, today is a new day—the past is the past. Rather than lamenting Senator Berger’s and Rabon’s past missteps, it’s time we offer solutions for a brighter future, and we at GRNC see Permitless Concealed Carry headed this way. Should Senator Berger, Rabon and other senate leaders once again fail to act, it would only be another demonstration of the behavior that caused the loss of their veto-proof majorities (starting in January). Becoming squishy on gun rights, inaction and half-measures—these are the things that cause voters to sit home on Election Day, and this surely influenced the lackluster election results. Bold action, adhering to campaign rhetoric, and sweeping advances of the people’s rights—these are the things that victories are made of, and we can only hope that Senator Berger and others have learned this lesson, and have already started preparing for future victories. (Hint: passing HB-746 would be a good start). Below, you’ll find information about how you can urge senate leader Phil Berger to act fast, pass HB-746 and then override the governor’s likely veto. There is no reason this can’t be done, and it absolutely should be. Hello, my name is ____________, and I am calling to insist that Senator Berger utilize the veto-proof majority that Republicans still maintain in order to pass the omnibus gun bill, HB-746, and then override the governor’s likely veto. In the recent past, senate leadership disappointed voters on this bill, and on gun rights in general. However, Mr. Berger and other leaders now have a golden opportunity to make up for this and stand for gun rights. Of course, the clock is ticking on the supermajorities, so please tell Mr. Berger to act now, pass HB-746, and override the Governor’s likely veto. Thank you. EMAIL NC SENATE PRO TEM PHIL BERGER: Use the email address and the copy/paste text provided below, under ‘Deliver This Message,’ to send a strong message about advancing our civil rights at every possible turn. Suggested Subject: "Pass HB-746 While You Still Can"
I am writing to insist that you utilize the veto-proof majority that Republicans still maintain in order to pass the omnibus gun bill, HB-746, and then override the governor’s likely veto. In the recent past, senate leadership disappointed voters on this bill, and on gun rights in general. However, you and other leaders now have a golden opportunity to make up for this past disappointment and stand for gun rights. At this point, there is nothing to lose, and any perceived impediments to making HB-746 the law in our state are just that: perceived—but not real. Of course, the clock is ticking on the Republican supermajorities, so please act now, pass HB-746, and override the Governor’s likely veto. You may have seen the story last week that announced with great fanfare that Toms Shoes was going to donate up to $5 million to "combat gun violence" (sic). Since they are trendy shoes popular with Millennials, the announcement was made by company founder Blake Mycoskie on The Tonight Show with Jimmy Fallon. The money will go to organizations like Giffords, Everytown, Moms Demand, and March for our Lives among others. For those that don't know about Toms Shoes, their value proposition is that when you buy their trendy (and flimsy) shoes, they will donate another pair to a shoeless child in a Third World country. In other words, spend $50 on their shoes, feel good about yourself, and in return they will ship another pair which cost them probably a buck or two to Haiti or the Congo or a like country. What a great marketing ploy that even uber-liberal Vox calls a sham. Moreover, the shoes manufactured in China, Argentina, Haiti, and Africa could be coming from sweatshops. 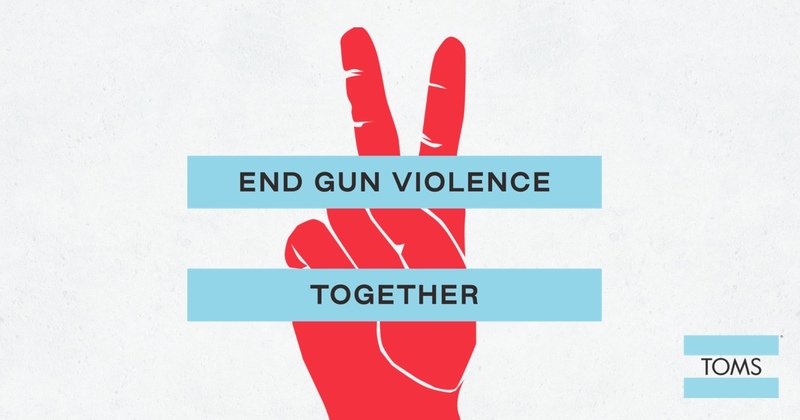 The End Gun Violence Together campaign even features its own trendy-looking logo that will now be used throughout Toms Shoe stores nationwide. 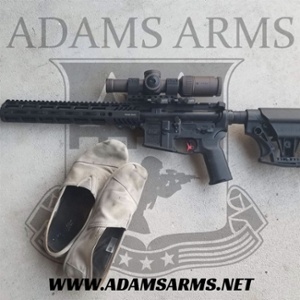 Adams Arms, the Florida based maker of piston ARs and piston conversion kits, saw this and is using it as the genesis for their own campaign to help homeless veterans and promote gun rights. They are calling it Adams Arms’ #MagsForToms BuyBack Movement. They are trading 30-round Amend2 magazines for new or used Toms Shoes. In states where 30-rounders are forbidden, they will trade a 10-round magazine. Their original idea was to take all the shoes traded in and burn them in an Instagram live video. Amend2 Magazines liked the Adams Arms plan so much that they donated the first batch of #MagsForToms to be traded for Toms Shoes. Details on how to make the trade are below. 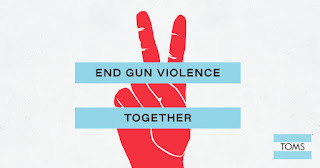 As Adams Arms correctly notes in their release, the Toms campaign which includes a push for universal background checks "to end gun violence" (sic) will do nothing to keep firearms out of the hands of criminals. I would go further and say it does nothing to address the root causes of the criminal misuse of firearms in places like Chicago or Baltimore. My granddaughter Olivia has Toms given to her that I'm sure she has outgrown. I may just to trade them in on a new magazine. In the meantime, I applaud Adams Arms for doing something positive for both the Second Amendment and homeless veterans. "Kentucky Bourbon Tales: Distilling the Family Business"
Kentucky Educational Television created a documentary featuring interviews with many of the first families of bourbon. These include the Beams, the Noes, the Samuels, the Russells, and the list goes on. To make this documentary KET took over 30 hours of interviews and distilled (no pun intended) it down to about 56 minutes. If you ever wanted a short history of bourbon and its makers, this is it. I imagine that the Kentucky Distillers Association played a large role in assembling the interviewees as there is one major distillery missing. That would be Buffalo Trace which is owned by Sazerac and which is not a member of the KDA. Nonetheless, this is a good documentary to sit back and watch while sipping on your favorite bourbon. It makes more sense to do this than to brave all the traffic and crowds on Black Friday! If you would like to hear more interviews in greater depth, the Louis B. Nunn Center for Oral History at the University of Kentucky has a page devoted to strictly to bourbon and its history. Nancy Pelosi (D-CA) will probably be the next Speaker of the House of Representatives. I say probably because there are some Democrats that are opposed to her and the aging leadership. She, Steny Hoyer (D-MD), and James Clyburn (D-SC) are all in their 70s. However, while this group of dissidents might prevent Pelosi from getting the requisite number of votes (218), it is doubtful they will win in the end. As the leadership fight escalates, Pelosi’s lined up endorsements from former President Barack Obama — who called Pelosi “one of the most effective legislative leaders” on Tuesday — and key advocacy groups that helped Democrats retake the majority. Progressive groups, gun control organizations, unions, reproductive rights groups like NARAL Pro-Choice and more have thrown their weight behind Pelosi’s speaker bid. The Brady Campaign and Shannon Watts have all formally endorsed Pelosi for Speaker. Moreover, Michael Bloomberg who "invested" over $100 million in this election cycle to get Democrats elected has worked closely with Pelosi and shared office space with her super PAC. It should be obvious - expect gun control to be on the Democrats agenda in the House from day one of the new Congress. Pelosi has a constituency to repay and she will. I fully expect that bills will be introduced that will contain every gun control measure that you can think of and some that we haven't. Moreover, these bills will get a hearing in the House Judiciary Committee and most will pass in the House. Furthermore, the Hearing Protection Act, national reciprocity, and even provisions for use of Pittman-Robertson funds to construct shooting ranges are dead. Our only hope for stopping these infringements will be the Senate which remains in Republican hands. Even then, there are some Republicans who might vote for things like red flag laws or bans on bump fire stocks. Fortunately, the filibuster is still alive when it comes to bills passing the Senate and it still will require 60 votes to invoke cloture. Therefore, if you haven't contacted your two Senators or Senator-elect, you better do it now and put opposition to gun control on their radar. The Chinese curse "may you live in interesting times" will epitomize the next two years when it comes to the fight for gun rights. The Second Amendment and the National Rifle Association have joined together to challenge parts of the recently passed Washington State Initiative 1639 in a federal lawsuit. The initiative contained a laundry list of gun control measures including a definition of an assault weapon (sic) that would include Ruger 10/22s, raised the age to purchase semi-automatic rifles to 21, specified waiting periods, enacted a safe storage provision, includes a $25 tax on each semi-automatic rifle sold, requires law enforcement to verify annually that owners of handguns and semi-auto rifles are legally allowed to own them, and it includes a training requirement. The initiative was funded in great part by billionaires such as Michael Bloomberg, Nick Hanauer, and the late Paul Allen. The goal, while not state overtly, is to kill out the gun culture in Washington State by making it so onerous and creating such a slippery slope that casual gun owners will just give up. You can hear some thoughts on this from a Washington State resident in Episode 308 of The Squirrel Report podcast. The lawsuit, Mitchell et al v. State of Washington et al, was filed on Wednesday in US District Court for the Western District of Washington. It is a complaint for both a declaratory judgment and injunctive relief based upon a claim of violations of the Commerce Clause, and the 2nd and 14th Amendment. The plaintiffs are firearms dealers Daniel Mitchell and Robin Ball, 19 year old competitive shooter Luke Rettmer who is a member of the US Long Range Rifle Under 21 team, 19 year old Army reservist and college student Nathaniel Casey, and recreational shooters Armen Tooloee and Matthew Wald who are 20 and 19 years old respectively. 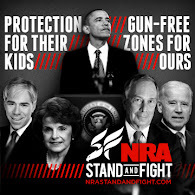 The Second Amendment Foundation and the National Rifle Association are the organizational plaintiffs in the case. The lawsuit focuses in on four aspects of I-1639 which goes into effect, in part, on January 1, 2019 with the remainder going into effect on July 1, 2019. First, it challenges Section 12 of the Initiative's ban on the sale of semi-automatic rifles to out-of-state residents on the grounds it "impermissibly burdens interstate commerce in violation of the Commerce Clause of the United States Constitution, Art. I § 8 cl. 3." Secondly, the lawsuit challenges Section 13 of the Initiative which raises the age to purchase semi-automatic rifles to 21. It seeks a declaration that "by preventing the sale to otherwise qualified adults under age 21 of certain rifles, impermissibly burdens their exercise of rights guaranteed by the Second Amendment to the United States Constitution." They are making this claim on behalf of both the Young Adult Plaintiffs and the Organizational Plaintiffs. It is asserted that no state interest justifies this infringement and that the ban is broader than needed to serve any "possible alleged governmental interest." Thirdly, the lawsuit contends that the Section 13 of the Initiative "impermissably burdens" the rights guaranteed to the Young Adult Plaintiffs under Article I Section 24 of the Washington Constitution. Finally, the lawsuit says that the intention of Washington State Attorney General Robert Ferguson to enforce the provisions of I-1639 and will be acting under "color of law". Thus, Ferguson will be depriving "plaintiffs of civil rights guaranteed by the Second Amendment to the United States Constitution, as applied by the Fourteenth Amendment to the United States Constitution." The plaintiffs seek to have the challenged portions of I-1639 declared unconstitutional and to enjoin enforcement of the entire I-1639 unless the challenged parts are ruled severable, and if so, then enforcement of the challenged parts. The complaint in its entirety can be found here. Both the Second Amendment Foundation and the National Rifle Association have issued releases regarding this lawsuit. “We are also considering additional legal challenges,” SAF Executive Vice President Alan Gottlieb confirmed. “We are disappointed that too many Evergreen State voters were fooled into supporting this 30-page gun control scheme, despite overwhelming law enforcement opposition. This initiative is an affront to the constitutional rights enshrined in the Second Amendment and the Washington state constitution, especially for young adults. I, for one, am quite pleased to see the Second Amendment Foundation and the National Rifles Association working together on this lawsuit and not competing with one another for bragging rights. This is the way it should be. Rep. Jonathan Stickland (R-TX-House 92) is a pro-gun conservative and an advocate for constitutional carry in Texas. The Texas House of Representatives has recently opened their filing of bills for the upcoming session. My friend and fellow podcaster Rachel Malone alerted me to a new bill he has introduced. I love his announcement of it on Twitter. One of the YouTube channels I enjoy watching is from a guy who calls himself Garand Thumb. Despite his resemblance to Travis Haley, he is not his son. Mike Jones (his actual name) is, however, an active duty USAF SERE Specialist. His videos have a lot of equipment testing reviews. One of his most recent videos examines an old school M16A1 versus a more modern AR-15 SBR with all the bells and whistles. As I've accumulated most of the parts to build my own retro M16A1 - though, of course, semi-auto - I was very interested in his impressions. He ran a variety of shooting drills with both rifles. With the exception of having to move around a barrier, they were very comparable. One thing he noted was how well balanced the M16A1 was in comparison to his SBR and to an actual M4 carbine. "I want gun control and I hope to God nobody else sends me any more prayers." The above quote comes from Susan Orfanos. She was the mother of Telemachus Orfanos who was one of the victims in the multiple murders committed at the Borderline Bar in Thousand Oaks, California. It was reported on the CBS Evening News for Friday, November 9th. "He didn't come home last night," said his mother, Susan. "I don't want prayers. I don't want thoughts. I want gun control and I hope to God nobody else sends me any more prayers. I want gun control. No more guns." The link to the story includes the video interview with her and a friend of the murderer. I can excuse the bitter words of a distraught mother who lost a son. However, I have also gotten emails from both the Brady Campaign and the cult of personality known as Giffords calling for more gun control and asking for donations. Excuse me but these murders happened in the gun control paradise known as California. Giffords Law Center rates the state an "A". It is the only state in the Union rated this high. Even New York, New Jersey, and Massachusetts only get A minuses. In the last Brady Campaign rankings I can find from 2015, California was the number one state in terms of adopting the gun control measures they wanted. Highly restrictive may issue concealed carry? Purchase of ammunition only through licensed dealers? Background check to buy ammo? Ban carry in establishments that serve alcohol? The state has every thing that the gun prohibitionists have been calling for to supposedly stop "gun violence" and "mass shootings" and yet it failed. When a murderer is determined to commit evil deeds the weapon really almost becomes irrelevant. It could just as easily have been an attack using a knife as in Melbourne, Australia on Friday. Even worse might have been an arson attack where an exit was illegally locked or blocked. Some of the worst night club fires in the US and the rest of the world have been due to arson. My point is that there is little that can be done to stop the initial attack even with the most restrictive of laws. Evil people will do what evil people will do. That said, there are a number of things that might have lessened the toll. For example, if the six off-duty cops there had been allowed to carry in the Borderline Bar, they could have responded with deadly force to stop the murders. Or, for example, as Greg Ellifritz points out, the murderer posted to Facebook and Instagram during the attack which was an opportunity to attack the murderer when he was distracted. While it might have been illegal in California, in many states you can carry in a place that serves alcohol so long as you don't drink. This would be the place for Designated Defenders as suggested by Massad Ayoob. I'm not sure how to prevent all mass violence events. I do think Malcolm Gladwell is on to something with his theory of threshholds where each event begets a larger and worse event. Media publicity doesn't help. I'm not saying that it shouldn't be reported but restraint and discretion should be exercised. For a start, do like many bloggers and academics have pledged: don't report the killer's name. As the No Notoriety campaign suggests focus on the victims and not the killer. It would be a start. In the meantime, be alert and be careful where you go. This post has nothing to do with lawyers - not even election lawyers. It has nothing to do with guns - not even gun control. And this post has might have something to do with money as in an email scam. We all get spam and we probably all have received emails from Nigerian princes or the widow of a long deposed African dictator offering a share of the wealth if we help them collect it. However, this email was different. It was from a medium named Amanda who is offering to "bend fate in my favour". The only problem is that Medium Amanda hasn't quite figured out how to customize her emails to each and every recipient. Your energy came to me in a beautiful vision. I see that you are at a crossroads. You can pick either side: fortune will smile upon you, or disaster will strike. I possess the gift to bend fate in your favour. This means that your cash flows will considerably increase within the foreseeable future. All I need is your approval to change your destiny. I need some information from you in order to tell you exactly what you have to do to build your fortune. If you do not take any action within 5 days, I can no longer help you avoid your fate. Click the link below so that I can tell you how you can realize your biggest dreams. This is top priority for me, so let me give you the answer as soon as possible. Medium Amanda even included a picture of herself! The cynic in me thinks that this picture of Medium Amanda kind of looks like a stock photo and that her offer to help me realize my biggest dreams probably is a scam. Nonetheless, I am selfish so will keep her link of an offer of help all to myself. And to all the Medium Amandas out there, thank you for giving me something to write about on a cold, damp, grey Monday morning. H. G. Wells called the Great War or World War I the "war to end all wars." We know that was a mythical false hope. Indeed, it can be rightly said that the Treaty of Versailles created the conditions that led, in no small part, to World War II. The Armistice that ended the fighting on the Western Front went into effect at 11 am Paris Time on November 11, 1918. At that time, fighting was to cease. However, as I noted in a post a few years ago, fighting continued and men still died right up to until that time. Private Henry Gunther of Baltimore continued fighting to the end and was killed at 10:59 am as he charged a German machine gun nest. He was officially the last Allied soldier to die in combat. Thus, this recording released by the Imperial War Museum in London is all the more eloquent as it begins with artillery fire and ends with the sound of birds singing. It comes from a recording made in the American sector near the River Moselle just before and after the eleventh hour. So on this Veterans Day, the 100th anniversary of the Armistice ending fighting in World War I, let us remember all those living and dead who served in our country's armed services. Today marks the 243rd birthday of the founding of the United States Marine Corps at Tun Tavern in Philadelphia. Even though I come from an Army family, I recognize the role that the Marines have played in protecting our country here and abroad. Below is the Commandant of the Marine Corp's birthday message. So to all my friends, new and old, who served wearing the globe and anchor, Semper Fi! Mentioned in the Commandant's message is Gunny Sgt. John Canley who was recently awarded the Medal of Honor for his bravery and leadership during the Battle of Hue'. If you'd like to know more about his actions as well as the actions of all the Marines who fought to retake Hue', I'd urge you to read Mark Bowden's book Hue' 1968: A Turning Point of the American War in Vietnam. The hardback is available on Amazon at deep discount ($8.90 as of this posting) which is actually cheaper than the paperback. You may have read about the active shooter event at Topsail High School in Pender County, NC that turned out to be a malfunctioning hot water heater. It made many news sources this morning. One reader on the Firearms and Politics email list had this comment about it. Don't relax yet. David Hogg is claiming that the water heater was funded by Russian money funneled through the NRA. Film at 11. After this week, we need something to laugh about and especially if it is at the expense of the gun prohibitionists. The National Shooting Sports Foundation sent out an email yesterday analyzing the midterm elections for their impact on the firearms industry as well as on firearm regulations. They will also be having a pair of webinars next Tuesday afternoon which I hope to be able to watch. I'll report on those afterwards. I think the NSSF is correct in that a lot of bills will be proposed and may even pass the House dealing with gun control. These will then die in the Senate. They refer to the Senate as the Red Wall. I think they are also correct that the pace at which new judges will be confirmed will pick up. The results are still trickling in on Wednesday, but we’re getting a clearer picture of what we can expect when it comes to the next two years for gun laws in the United States. The U.S. House of Representatives will flip back to Democrat control in the 116th Congress. There are several West Coast races still awaiting final counts, but Fox News’ Karl Rove predicted the final count will be 228-207 in favor of Democrats, which will see the Speaker of the House’s gavel change hands. The largest convention centers in the United States are not in Las Vegas. 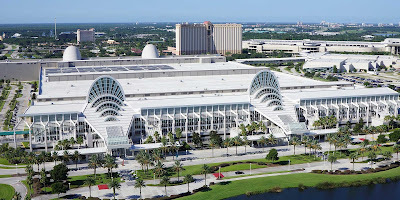 The largest, McCormick Place, is in Chicago and then the second largest, the Orange County Convention Center, is in Orlando, Florida. The Sands Expo Center which is the site of the SHOT Show comes in at tenth in size. I can understand why McCormick Place was not chosen for the SHOT Show. Despite its size which I can assure you is huge having driven right past it twice in the last week, no one in their right mind would want to hold a convention in January in frigid Chicago. I won't even speak to the anti-gun politics of Chicago as a reason to avoid having the firearms industry trade show there. I come from the school of rewarding our friends and punishing our enemies. Nevada voters just elected Democrats to three out of four House seats including one flipped seat, ousted Dean Heller (R-NV) in favor of Jacky Rosen (D-NV) in the Senate, flipped the governor's office from Republican to Democrat, hold both houses of the state legislature, and now have only one Republican official, Secretary of State Barbara Cegavske, elected statewide. The Las Vegas Sun opines that Democrat dominance of the state should continue thanks to Latinos and young voters. I'm sure you might want to add (some) ex-pat Californians to that list as well. Contrast this with the State of Florida. Rep. Ron DeSantis (R-FL) beat Tallahasse Mayor Andrew Gillum (D-FL) for the governorship. Rick Scott (R-FL) beat three-term incumbent Bill Nelson (D-FL) for the US Senate. Republicans hold the other three statewide offices (AG, Ag Commissioner, and Chief Finance Officer). Despite losing two seats in House delegation to Democrats, Republicans still hold a 14 to 13 edge. They are also projected to hold majorities in both the state House and Senate. The Sands Expo Center which is the location of the SHOT Show in Las Vegas has about 1.2 million square feet of exposition space. Earlier this year it was announced that the SHOT Show would expand their venue to include the MGM Grand Conference Center in 2020 and the Caesars Forum in 2021. 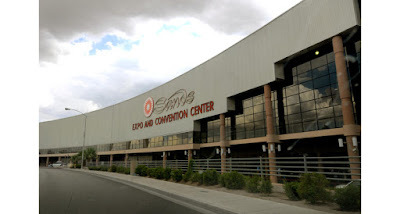 According to the announcement, it is due to running out of space at the Sands Expo Center and having to turn away potential exhibitors. The Orange County Convention Center, by contrast, has 2.1 million square feet of exposition space and is the nation's second largest convention center. You would not need to expand the SHOT Show to multiple locations to handle the growth in exhibitors. OCCC also has over 6,000 parking spaces. Orlando does have fewer hotel rooms with "only" about 121,000 rooms as compared to Las Vegas which has approximately 175,000 rooms available. However, when you expand out of the city limits of Orlando to places like St. Cloud and Kissimmee you thousands of more rooms. Another advantage to Orlando is the generally warmer, even balmy, weather you are likely to find there in January. I would be all for immediately switching the 2020 SHOT Show from Nevada to Florida for many of the reasons mentioned above including more space and a gun friendlier location. However, it won't happen overnight. The fly or flies in the ointment on making the switch are two-fold. First, the National Shooting Sports Foundation has extended their contract with the Sands Expo Center through 2027. I don't know if this is because they got a better deal from Sheldon Adelson or because they just were very familiar with the location. The second issue is a shooting range large enough to handle Industry Day at the Range. The Boulder Rifle and Pistol Club is outstanding in that regard. There are a number of shooting ranges in Central Florida but nothing approaching it that I know of. To conclude, the gun industry has changed from being a boys' club to being more inclusive of women and families. You see fewer and fewer "booth babes" at the SHOT Show and the NRA Annual Meeting than in the past. It would be nice if the industry's major event would leave Las Vegas behind and move to a more gun and family friendly location like Orlando. We'll just have to wait and see. Illinois gun owners and voters are faced with the choice today between Gov. Bruce Rauner (R-IL) and billionaire and Hyatt Hotels' heir J.B. Pritzker. From what my Prairie State friends tell me, Rauner has been somewhat ineffectual as governor but has vetoed some of the most egregious gun control legislation to come out of the Illinois General Assembly. Pritzker, on the other hand, promises to support the whole litany of gun control from gun bans to state licensing of firearms dealers. The RealClearPolitics poll average on this race gives a clear edge to Pritzker. It will stay that way if gun owners stay home. Both the Illinois State Rifle Association and Illinois Carry are supporting Rauner who they say has had an open door to them. Expect that door to be nailed shut under Pritzker. Illinois Carry sent this out yesterday by email. They are correct in asserting that if all FOID card holders voted the 2A that it might be safe in Illinois. "NO safe space for NRA in Illinois!" J.B. Pritzker vows, “The NRA will have no safe space in Illinois if I am elected governor.” That means NO safe space for you and me! Governor Rauner is the absolute only logical choice for gun owners. He has a FOID card and supports the Second Amendment. The Governor has provided IllinoisCarry access to his office and staff. He has sought our opinions on gun legislation. This last legislative session, his veto and amendatory veto power was all that stood between gun owners and the anti-Constitution tyrants in Springfield. If Pritzker is elected – that protection will be gone and all he will need is a simple majority to pass all the horrible anti-gun bills that gun owners have been fighting against all these years. Imagine how safe the Second Amendment would be here in Illinois if all 2,287,291 FOID card holders went into the voting booth Tuesday and voted for pro-Second Amendment candidates like Gov. Rauner. Is At Stake On Nov. 6th! We Urge All Gun Owners To Vote! If you have not partaken in the early voting period and are still wondering who is or isn't the pro-gun candidate in North Carolina, Grass Roots North Carolina and GRNC-PVF have a convenient way to check both their ratings and their recommendations. They also have recommendations on the six Constitutional amendments to the North Carolina Constitution as well as recommendations on the statewide judicial races. The recommendations are from GRNC-Political Victory Fund while the evaluations are from GRNC itself. This last one is critical. Anita Earls is running as a Democrat against Justice Barbara Jackson (R-NC). She is a far-left SJW who would tip the NC Supreme Court even more to the Left and presumably anti-gun. She was the executive director of the Southern Coalition for Social Justice which should say it all. She is very well funded compared to her competitors. Moreover, don't be fooled by the R after Chris Anglin's name. He is a Democrat who only switched to siphon away votes from Justice Jackson. I anticipate that the Republicans could very well lose their super-majority in the General Assembly meaning that they can't easily override vetoes by anti-gun Gov. Roy Cooper (D-NC). Given the number of anti-gun candidates running as Democrats, the era of pro-gun Democrats in North Carolina seems over and any new gun rights legislation will have a hard time passing and getting signed by the governor. Tuesday, November 6th is Election Day. Polls are open from 6:30 a.m. until 7:30 p.m. If you've waited for Election Day to vote, you can review GRNC Candidate Evaluations and your GRNC-PVF Candidate Recommendations at any time. Candidate recommendations, which are more limited than blanket “endorsements,” are not made in all races, only in races where a clear pro-gun candidate stands out or where strategic voting is necessary to keep anti-gun candidates out of office. You can CLICK HERE to see GRNC Candidate Evaluations. These are just one more tool voters can use to understand where any given candidate stands on gun rights, and a copy of these evaluations can come in quite handy in the voting booth. Print the PDF that is sorted by name and take it with you to vote. Just check this alphabetical list against the candidates on your ballot, and you're in business. You may have also received the Candidate Evaluations in the mail, in GRNC's "Remember in November" Voter Guide. CLICK HERE to review all of GRNC-PVF’s Candidate Recommendations. After clicking over to the page, scroll down to find your recommendations for the US House, important judicial races, the NC Senate and the NC House. If a district is not listed, GRNC-PVF was unable to recommend a candidate in that race. If you don't know which districts are yours, see below. CLICK HERE to look yourself up at the State Board of Elections. Among other things, this voter lookup tool will display the district information pertinent to you. Still having trouble finding your districts? CLICK HERE to see the GRNC Candidate Evaluations (open the PDF sorted by name). Print this, take it with you to vote, and you can check the sheet against the candidates on your ballot. This is your last chance to vote. To find your Election Day voting location, CLICK HERE to look yourself up. Among other things, this State Board of Elections voter lookup tool will display your Election Day voting location (it will probably not be the same location as your early voting location(s)). On Election Day, polls are open from 6:30 a.m. to 7:30 p.m. Knife Rights has announced that they will appeal their long-running case against New York over the definition of gravity knives to the Supreme Court. The case centers around common folding knives that have been the target of enforcement by the NYPD and the Manhattan District Attorney. The victims of this unjust definition have usually been trades people and minorities. Justice Ruth Bader Ginsberg last week granted us a 60-day extension until January 13th, 2019, for submission of our petition for a writ of certiorari asking the Court to hear our appeal.